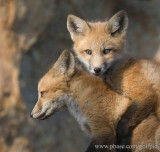 A family of six fox pups (official terminology is kits) and mother have a den under a maintenance shed at a popular park in Montreal, Quebec. The area around the den is roped off with yellow tape to keep people from getting too close. However, the perimeter is only about 25 feet away and great close-up views of the foxes can be had. The mother fox brings food back to the young pups frequently during the morning. Feeding time is full of activity as the young pups check out what she brought back while others tug at her teats for milk. She also appears to be used to having people around and allows a close approach, at one point crossing in front of me and others only a couple feet away.